Your Store for Success and Results! You'd do anything for your family. They are the centre of your world, the reason do do what you do, and nothing could ever replace them. That's why you want nothing but the best for them, from the roof over their heads, to their well being, down to even their entertainment. You want to keep them safe, and provide them the right tools for development. This includes what many families would very well consider their second home, so to speak: the family vehicle. You need to know that what you're driving not only gets everyone from point A to point B, but does so while keeping them in good hands. That's why the all-new 2017 Chrysler Pacifica is backed by advanced, innovative technologies that make it the most technologically advanced minivan in its class. This in turn brings the Pacifica to a new level of industry firsts, Best-in-Class features, and class-exclusive advantages that no other minivan could ever hope to surpass. From the outside, with the standard Keyless Enter 'n Go™, as well as the segment-exclusive hands-free power sliding doors and liftgate, entering your Pacifica becomes a breeze even with your hands full. On the inside, it's even more impressive-named one of Wards 10 Best Interiors, the Pacifica lets you enjoy the quietest interior in its class, along with the most advanced entertainment system in its class. The Pacifica doesn't just raise the bar for what defines a minivan. It blows convention out of the water, wiping the slate clean for a fresh, never-before-seen take on what a minivan can be. Of course, that doesn't mean it falls short on what your traditionally need a minivan for-space. It excels at storage capacity, with up to 243 possible seating configurations that make the Pacifica the industry's absolute most innovative passenger and cargo vehicle. This includes a lightweight, removable second-row centre seat, with second- and third-row seats that can seamlessly be stowed into the floor to accommodate a expansive flat cargo space. If that's still somehow not enough, the Pacifica is the best in its class in towing capability, so it's simply a matter of loading everything up on your trailer and driving off without leaving a single thing behind! Get the best for your family-get a Chrysler Pacifica. They, and you, deserve it. With Non-Commissioned Sales Experts and Experts at our Store You Will Not be Disappointed! Find All the Modern Vehicles and Options with Us Today! We Want Our Customers to Feel Like They're Being Treated Like Family While in Our Care! When considering the best vehicle for your family, safety is likely one of your top concerns. When equipped with the optional front crash prevention system, Pacifica models built after August 2016 earn the 2016 IIHS Top Safety Pick+ award-the all-new 2017 Chrysler Pacifica being the first minivan to ever do so! Backed by over 100 standard and available safety and security features, you can breathe easy and drive with confidence knowing you and your family are well protected within your Pacifica. That spark of pride within you that you feel every time you think about how great it is to live in Canada? That same passion goes into making every Chrysler Pacifica model, made right here at home in Windsor, Ontario. Built by Canadians for Canadians, the Pacifica is fast becoming a national icon, and was in fact chosen as the official vehicle for the Canada Day 2017 events in Ottawa! 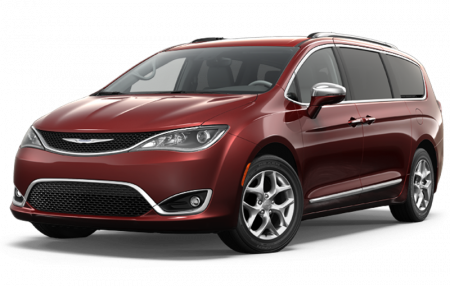 Choose Canada's minivan-the Chrysler Pacifica! The traditional minivan doesn't have the best track record in terms of fuel economy. The Chrysler Pacifica, on the other hand, changes all that. Equipped with the award-winning 3.6L Pentastar™ VVT V6, the Pacifica runs as efficiently as 8.4 L/100 km (34 mpg) highway, leading its class in fuel efficiency. That's less time wasted with fewer stops for fuel, and money saved that can go into more important things for your family. That refined exterior, coupled with a luxurious, comfortable interior, is actually hiding something. You might not guess at first glance, but the Pacifica harnesses some serious power under its hood. With the 3.6L Pentastar™ VVT V6 engine, it produces an impressive Best-in-Class 287 horsepower and 262 lb-ft of torque, topped with Best-in-Class towing capacity of up to 1,633 kg (3,600 lb)! You may not use all of that power every day, but you'll be glad to have it once you need it. projector headlamps and full-colour, customizable in-cluster display are available to make your RAM just right for you! The modern world allows for a lot of opportunities for drivers searching for a dealership that can live up and set better expectations than what is otherwise expected. 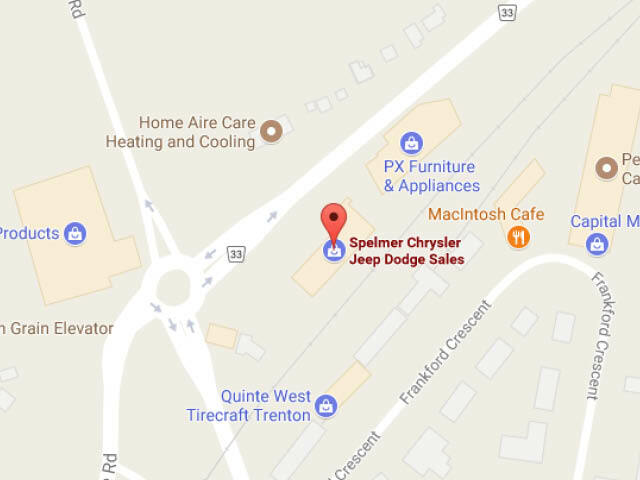 When you work with the team at Spelmer Chrysler you can be sure that you're going to find the resources and the rewards that give you peace of mind and the value that you know you deserve. We want to build an experience that gives you a reason to tell your friends and family to work with us, too! Whether that happens to mean you're the type of person that likes to hear that our sales team is non-commissioned, or you'll be more impressed by our no hidden fees policy - there's something for everyone at Spelmer Dodge. Work with us and let's make sure you get the results that makes your driving life more entertaining and more tailored to your needs. It's what we do! Come down and visit our store today at 51 Trenton Frankford Road in wonderful Trenton, ON! We can be reached by phone at (613) 394-3945. Find your dream team for all your automotive needs today with us!